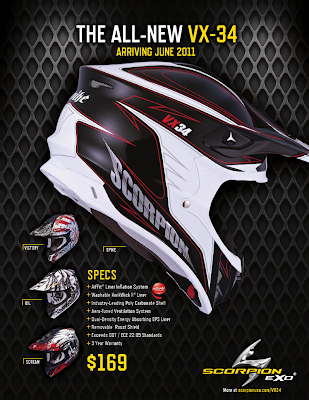 The brand new Scorpion VX-34 Helmet is coming very soon as their latest and greatest dirt helmet to date. Arriving in June 2011, we're excited to see the loads of upgrades the VX-34 possesses over its predecessor, the VX-24 dirt helmet. Check out the image below for the quick info (click to enlarge), and check out our in-depth look below that. First and foremost, the shell of the Scorpion VX-34 Helmet compared to all older models from Scorpion is much more aggressively styled. It now is in the same vein as some of the more aggressive lids from Bell, Shoei and the other leaders in the dirt world. The graphic schemes are wild as well, which is what we typically see from Scorpion. One of the major upgrades, beyond the shell shape, is the brand new KwikWick II liner, completely removable and washable, and utilizing finer materials that are better at moisture-wicking than the traditional Kwikwick system. The visor can be adjusted without tools and the Polycarbonate shell is one of the industry's finest. Beyond that, you can expect to see the Airfit helmet liner custom inflation system, an aero-tuned ventilation system, and a full DOT & ECE certification. We are extremely excited for this helmet and look forward to getting our hands on one for a full video review.